The Carnation Revolution (Portuguese: Revolução dos Cravos), also known as the 25th of April (Portuguese: 25 de Abril), was initially a 25 April 1974 military coup in Lisbon which overthrew the authoritarian Estado Novo regime. The revolution began as a coup organised by the Armed Forces Movement (Portuguese: Movimento das Forças Armadas, MFA), composed of military officers who opposed the regime, but it was soon coupled with an unanticipated, popular civil resistance campaign. The revolution led to the fall of the Estado Novo, the end of 48 years of authoritarian rule in Portugal, and Portugal's withdrawal from its African colonies. "[The] 25th of April forever!" Its name arose from the fact that almost no shots were fired, and Celeste Caeiro offered carnations to the soldiers when the population took to the streets to celebrate the end of the dictatorship; other demonstrators followed suit, and carnations were placed in the muzzles of guns and on the soldiers' uniforms. In Portugal, 25 April is a national holiday (Portuguese: Dia da Liberdade, Freedom Day) which commemorates the revolution. Since 1933, Portugual had been governed by an authoritarian dictatorship, the Estado Novo or New State. The Estado Novo, in turn, evolved from the Ditadura Nacional (National Dictatorship) set up after the 28 May 1926 coup d'etat (called the "National Revolution" under the Estado Novo). The revolution changed the government to a democracy and produced enormous social, economic, territorial, demographic and political changes. These changes evolved during (and after) a two-year transitional period known as Processo Revolucionário Em Curso (PREC, Ongoing Revolutionary Process), which was characterised by social turmoil and power disputes between left- and right-wing political forces. Despite repeated radio appeals by the revolutionaries asking the population to stay home, thousands of Portuguese citizens descended on the streets and mingled with the military insurgents. The military-led coup returned democracy to Portugal, ending the unpopular Colonial War (in which thousands of Portuguese citizens had been conscripted into military service) and replacing the Estado Novo regime and its secret police (which curbed civil liberties and political freedom). It began as a protest by Portuguese Armed Forces captains against a law: the Dec Lei nº 353/73 of 1973. A group of low-ranking Portuguese officers organised as the Armed Forces Movement (MFA, Movimento das Forças Armadas), including some who had fought pro-independence guerrillas in the Portuguese Empire's territories in Africa, and overthrew the Estado Novo regime which had ruled Portugal since the 1930s. Portugal's new regime pledged to end the colonial wars, and began negotiations with the African independence movements. By the end of 1974, Portuguese troops were withdrawn from Portuguese Guinea and the latter was a UN member state. This was followed by the independence of Cape Verde, Mozambique, São Tomé and Príncipe and Angola in 1975. The Carnation Revolution also led to Portugal's withdrawal from East Timor in south-east Asia. These events prompted a mass exodus of Portuguese citizens from Portugal's African territories (mostly from Angola and Mozambique), creating over a million Portuguese refugees — the retornados. Although PIDE (the Estado Novo's political police) killed four people before surrendering, the revolution was unusual because the revolutionaries did not use violence to achieve their goals. Holding red carnations (Portuguese: cravos), many people joined revolutionary soldiers on the streets of Lisbon in apparent joy and audible euphoria. Red is the colour of socialism and communism, the ideological tendencies of many anti-Estado Novo insurgents. It was the end of the Estado Novo (the longest-lived authoritarian regime in Western Europe), and the dissolution of the Portuguese Empire. In the aftermath of the revolution, a new constitution was drafted, censorship was prohibited, free speech was permitted, political prisoners were released and the Portuguese overseas territories in sub-Saharan Africa were granted independence. East Timor was also offered independence, shortly before it was invaded by Indonesia. At the beginning of the 1970s, nearly a half-century of authoritarian rule weighed on Portugal. After the 28 May 1926 coup d'état, Portugal implemented an authoritarian regime incorporating social Catholicism and integralism. In 1933, the regime was recast and renamed Estado Novo (New State). António de Oliveira Salazar was prime minister until 1968, when he had a stroke. Salazar was replaced in September 1968 by Marcello Caetano, who was deposed during the revolution. Portugal's Estado Novo government was initially tolerated by its NATO partners due to its anti-communist stance. Elections were rarely contested; the opposition used the limited political freedoms allowed during the brief election period to protest against the regime, withdrawing their candidates before the election to deny the regime political legitimacy. In 1958, General Humberto Delgado (a former member of the regime) stood against the regime's presidential candidate, Américo Tomás, and refused to allow his name to be withdrawn. Tomás won the election amidst claims of widespread electoral fraud. Immediately after the election, the Salazar government abandoned the practice of popularly electing the president and gave the task to the National Assembly, which was firmly under the regime's control. During Caetano's time in office, he made minor attempts at political reform that did not go nearly far enough for a generation that had no memory of the instability that preceded the 1926 coup. However, even these meager reforms were obstructed by Salazarist elements in the regime. The hardliners were supported by Tomás, who was unwilling to give Caetano as free a hand as Salazar had. The Estado Novo's political police, the PIDE (Polícia Internacional e de Defesa do Estado, later the DGS, Direcção-Geral de Segurança and originally the PVDE, Polícia de Vigilância e Defesa do Estado), persecuted opponents of the regime, who were often tortured, imprisoned or killed. The international community disliked the Portuguese regime. 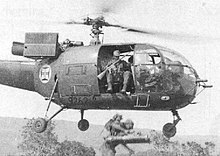 The Cold War was near its peak; Western- and Eastern-bloc states were supporting guerrillas in the Portuguese colonies, attempting to bring them under American or Soviet influence. The overseas policy of the Portuguese government, despite the desire of many colonial residents to remain under Portuguese rule, led to an abrupt decolonisation after the Carnation Revolution and the fall of the regime in April 1974. For the Portuguese rulers, the overseas empire was a matter of national interest. Independence movements began in the African colonies of Portuguese Mozambique, Portuguese Congo, Portuguese Angola, and Portuguese Guinea. The unrest forced the Salazar and Caetano regimes to spend more of Portugal's budget on colonial administration and military expenditure, and the country became increasingly isolated from the rest of the world. During the war, Portugal faced increasing dissent, arms embargoes and other international sanctions. The war became more unpopular in Portugal due to its length and cost, the worsening of diplomatic relations with other United Nations member states, and its role in perpetuating the Estado Novo regime. Its escalation led to the mutiny of FAP in the Carnation Revolution. Atrocities such as the Wiriyamu Massacre undermined the war's popularity and the government's diplomatic position, although details of the massacre are still disputed. Many left-wing students and anti-war activists were forced to leave Portugal to escape conscription, imprisonment and torture by government forces. Between 1945 and 1974, however, three generations of right-wing militants in Portuguese schools were guided by a revolutionary nationalism partially influenced by European neo-fascism. The core of the radical students' struggle was an uncompromising defense of the Portuguese Empire and an authoritarian regime. The Estado Novo regime's economic policy encouraged the formation of large conglomerates. The regime maintained a policy of corporatism which resulted in the placement of much of the economy in the hands of a number of strong conglomerates, including those founded by the families of António Champalimaud (Banco Totta & Açores, Banco Pinto & Sotto Mayor, Secil, Cimpor), José Manuel de Mello (Companhia União Fabril), Américo Amorim (Corticeira Amorim) and the dos Santos family (Jerónimo Martins). The Companhia União Fabril (CUF) was one of the largest and most-diversified Portuguese conglomerates; its core businesses included cement, petrochemicals, agrochemicals, textiles, beer, beverages, metallurgy, naval engineering, electrical engineering, insurance, banking, paper, tourism and mining. Although its corporate headquarters was in mainland Portugal, it had branches, plants and projects throughout the Portuguese Empire (especially in the territories of Cabinda, Angola and Mozambique). Other medium-sized family companies specialised in textiles (such as those in Covilhã and the northwest), ceramics, porcelain, glass and crystal (such as those in Alcobaça, Caldas da Rainha and Marinha Grande), engineered wood (such as SONAE, near Porto), canned fish (Algarve and the northwest), fishing, food and beverages (liqueurs, beer and port wine), tourism (in Estoril, Cascais, Sintra and the Algarve) and agriculture (the Alentejo, known as the breadbasket of Portugal) by the early 1970s. Rural families engaged in agriculture and forestry. During the 1961–1974 Portuguese Colonial War (a counterinsurgency against guerrillas), Portuguese Congo, Portuguese Angola and Portuguese Mozambique (colonies at the time) experienced economic growth in the production of oil, coffee, cotton, cashews, coconuts, timber, minerals (including diamonds), metals (such as iron and aluminium), bananas, citrus, tea, sisal, beer, cement, fish and other seafood, beef and textiles. Labour unions were prohibited, and minimum wage laws were not enforced. The outbreak of colonial wars in Africa set off significant social changes, among them the rapid incorporation of women into the labour market. Marcelo Caetano fostered economic growth and social improvement, such as a monthly pension to rural workers who had never contributed to Portugal's social security. The objectives of Caetano's pension reform were to increase equity and economic efficiency and reduce fiscal imbalance. After Salazar's stroke in 1968, Caetano took over as prime minister. He adopted a slogan of "continuous evolution", suggesting reforms of Salazar's system. Caetano's Primavera Marcelista (Marcelist Spring) included greater political tolerance and freedom of the press, and was seen as an opportunity for the opposition to gain concessions from the regime. Portugal had a taste of democracy in 1969, and Caetano authorised the country's first democratic labour-union movement since the 1920s. However, after the elections of 1969 and 1973 it became clear that past political repression would continue against communists, anti-colonialists and other opponents of the regime. By the early 1970s, the Portuguese Colonial War had a steadily-increasing budget. The Portuguese military was overstretched and there was no political solution in sight. Although the number of casualties was relatively small, the war had entered its second decade; Portugal faced criticism from the international community, and was becoming increasingly isolated. The war had a profound impact on the country. Thousands of young men avoided conscription by emigrating illegally, primarily to France and the United States. The revolutionary Armed Forces Movement (MFA) began as an attempt to liberate Portugal from the Estado Novo regime and challenge new military laws which were coming into force. The laws would reduce the military budget and reformulate the Portuguese military. Younger military-academy graduates resented Caetano's programme of commissioning militia officers who completed a brief training course and had served in the colonies' defensive campaigns at the same rank as academy graduates. The war in the colonies was becoming increasingly unpopular in Portugal, and the military insurgency gained momentum. After the revolution, the MFA began to negotiate with African pro-independence guerrillas. The new government in Lisbon was no longer inclined to support Portugal's chaotic, expensive empire, and the Portuguese territories in Africa were rapidly granted independence. Mid-1970s government poster by João Abel Manta (povo means "people"). The person on the left, wearing a military cap, fatigues and boots, is holding a garden fork; the person on the right, wearing a farmer's cap and a military shirt, is holding a rifle. In February 1974, Caetano decided to remove General António de Spínola from the presidency in the face of Spínola's increasing disagreement with the promotion of military officers and the direction of Portuguese colonial policy. This occurred shortly after the publication of Spínolas' book, Portugal and the Future, which expressed his political and military views of the Portuguese Colonial War. Several military officers who opposed the war formed the MFA to overthrow the government in a military coup. The MFA was headed by Vítor Alves, Otelo Saraiva de Carvalho and Vasco Lourenço, and was joined later by Salgueiro Maia. The movement was aided by other Portuguese army officers who supported Spínola and democratic civil and military reform. It is speculated that Francisco da Costa Gomes actually led the revolution. The coup had two secret signals. The first was the airing at 10:55 p.m. of Paulo de Carvalho's "E Depois do Adeus" (Portugal's entry in the 1974 Eurovision Song Contest) on Emissores Associados de Lisboa, which alerted the rebel captains and soldiers to begin the coup. The second signal came on 25 April 1974 at 12:20 a.m., when Rádio Renascença broadcast "Grândola, Vila Morena" (a song by Zeca Afonso, an influential political folk musician and singer who was banned from Portuguese radio at the time). The MFA gave the signals to take over strategic points of power in the country. Six hours later, the Caetano government relented. Despite repeated radio appeals from the "captains of April" (the MFA) advising the population to stay home, thousands of Portuguese took to the streets – mingling with, and supporting, the military insurgents. A central gathering point was the Lisbon flower market, then richly stocked with carnations (which were in season). Some of the insurgents put carnations in their gun barrels, an image broadcast on television worldwide which gave the revolution its name. Although no mass demonstrations preceded the coup, spontaneous civilian involvement turned the military coup into a popular revolution "led by radical army officers, soldiers, workers and peasants that toppled the senile Salazar dictatorship, using the language of socialism and democracy. The attempt to radicalise the outcome," noted a contemporay observer of the time, "had little mass support and was easily suppressed by the Portuguese Socialist Party and its allies." Caetano found refuge in the main Lisbon military police station at the Largo do Carmo. This building was surrounded by the MFA, which pressured him to cede power to General Spínola. Caetano and President Américo Tomás fled to Brazil; Caetano spent the rest of his life there, and Tomás returned to Portugal a few years later. The revolution was closely watched by neighbouring Spain, where the government (and the opposition) were planning the succession of Spanish dictator Francisco Franco. Franco died a year and a half later, in 1975. After the coup, power was held by the National Salvation Junta (a military junta). Portugal experienced a turbulent period, known as the Processo Revolucionário Em Curso (Ongoing Revolutionary Process). The conservative forces surrounding Spinola and the MFA radicals initially confronted each other (covertly or overtly), and Spinola was forced to appoint key MFA figures to senior security positions. 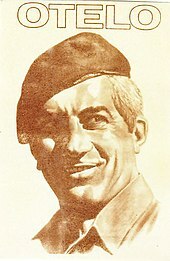 Right-wing military figures attempted an unsuccessful counter-coup, resulting in Spinola's removal from office. Unrest within the MFA between leftist forces (often close to the Communist Party) and more-moderate groups (often allied with the Socialists) eventually led to the group's splintering and dissolution. This stage of the PREC lasted until the 25 November 1975 pro-communist coup, followed by a successful counter-coup by pro-democracy moderates, and was marked by constant friction between liberal-democratic forces and leftist-communist political parties. Portugal's first free election was held on 25 April 1975 to write a new constitution replacing the Constitution of 1933, which prevailed during the Estado Novo era. Another election was held in 1976 and the first constitutional government, led by centre-left socialist Mário Soares, took office. Before April 1974, the intractable Portuguese Colonial War in Africa consumed up to 40 percent of the Portuguese budget. Although part of Guinea-Bissau became independent de facto in 1973, Bissau (its capital) and the large towns were still under Portuguese control. In Angola and Mozambique, independence movements were active in a few remote areas from which the Portuguese Army had retreated and their economies were booming. A consequence of the Carnation Revolution was the sudden withdrawal of Portuguese administrative and military personnel from its overseas colonies. Hundreds of thousands of Portuguese Africans returned to Portugal. These people—workers, small businesspeople, and farmers—often had deep roots in the former colonies and became known as the retornados. Angola began a decades-long civil war which involved the Soviet Union, Cuba, South Africa, and the United States. Millions of Angolans died in the aftermath of independence due to armed conflict, malnutrition and disease. After a brief period of stability, Mozambique became embroiled in a civil war which left it one of the poorest nations in the world. The country's situation has improved since the 1990s, and multi-party elections have been held. East Timor was invaded by Indonesia, and would be occupied until 1999. There were an estimated 102,800 conflict-related deaths from 1974 to 1999 (about 18,600 killings and 84,200 deaths from hunger and illness), most of which occurred during the Indonesian occupation. After a long period of one-party rule, Guinea-Bissau experienced a brief civil war and a difficult transition to civilian rule in 1998. Cape Verde and São Tomé and Príncipe avoided civil war during the decolonisation period, and established multi-party political systems by the early 1990s. Macau remained a Portuguese colony until 1999, when China took control in a joint declaration and enacted a "one country, two systems" policy similar to that of Hong Kong. The Portuguese economy changed significantly between 1961 and 1973. Total output (GDP at factor cost) had grown by 120 percent in real terms. The pre-revolutionary period was characterised by robust annual growth in GDP (6.9 percent), industrial production (nine percent), consumption (6.5 percent), and gross fixed capital formation (7.8 percent). The revolutionary period experienced a slowly-growing economy, whose only impetus was its 1986 entrance into the European Economic Community. Although Portugal never regained its pre-revolution growth, at the time of the revolution it was an underdeveloped country with poor infrastructure, inefficient agriculture and the worst health and education indicators in Europe. Pre-revolutionary Portugal had some social and economic achievements. After a long period of economic decline before 1914, the Portuguese economy recovered slightly until 1950. It began a period of economic growth in common with Western Europe, of which it was the poorest country until the 1980s. Portuguese economic growth between 1960 and 1973 (under the Estado Novo regime) created an opportunity for integration with the developed economies of Western Europe despite the colonial war. Through emigration, trade, tourism and foreign investment, individuals and companies changed their patterns of production and consumption. The increasing complexity of a growing economy sparked new technical and organisational challenges. On 13 November 1972, Fundo do Ultramar (The Overseas Fund, a sovereign wealth fund) was enacted with Decreto-Lei n.º 448/ /72 and the Ministry of Defense ordinance Portaria 696/72 to finance the war. Although the war was victorious in Angola, it was poorly contained in Mozambique and stalemated in Portuguese Guinea; therefore, the government created continuous sources of financing for a long-term war effort. Decretos-Leis n.os 353, de 13 de Julho de 1973, e 409, de 20 de Agosto were enforced to reduce military expenses and increase the number of officers by incorporating militia and military-academy officers as equals. The collective farms established in Alentejo after the revolution were inefficient. According to government estimates, about 900,000 hectares (2,200,000 acres) of agricultural land were seized between April 1974 and December 1975 as part of land reform; about 32 percent of the appropriations were ruled illegal. [full citation needed] In January 1976, The government pledged to restore the illegally-occupied land to its owners in 1976, and enacted the Land Reform Review Law the following year. Restoration of illegally-occupied land began in 1978. In 1960, Portugal's per-capita GDP was 38 percent of the European Economic Community average. By the end of the Salazar period in 1968 it had risen to 48 percent, and in 1973 it had reached 56.4 percent; the percentages were affected by the 40 percent of the budget which underwrote the African wars). In 1975 (the year of greatest revolutionary turmoil), Portugal's per-capita GDP declined to 52.3 percent of the EEC average. Due to revolutionary economic policies, oil shocks, recession in Europe and the return of hundreds of thousands of overseas Portuguese from its former colonies, Portugal began an economic crisis in 1974–1975. Real gross domestic product growth resumed as a result of Portugal's economic resurgence since 1985. The country's 1991 per-capita GDP reached 54.9 percent of the EEC average, slightly exceeding the level at the height of the revolutionary period. A January 2011 story in the Diário de Notícias (a right-wing Portuguese tabloid newspaper) reported that the government of Portugal encouraged overspending and investment bubbles in public-private partnerships between 1974 and 2010, and the economy has been damaged by risky credit, public debt creation and mismanaged European structural and cohesion funds for almost four decades. Prime Minister José Sócrates' cabinet was unable to foresee or forestall this when symptoms first appeared in 2005, and could not ameliorate the situation when the Portugal was on the verge of bankruptcy in 2011 and required financial assistance from the International Monetary Fund and the European Union. The constitution of 1976 guarantees all religions the right to practice, and non-Catholic groups are recognised as legal entities with the right to assemble. Non-Catholic conscientious objectors have the right to apply for alternative military service. The Catholic Church, however, still sought to impede other missionary activity. The ban on Jehovah's Witnesses activity was abolished. The Witnesses were registered as a religious organisation in December 1976, and organised their first Portuguese international convention in Lisbon in 1978. Freedom Day (25 April) is a national holiday, with state-sponsored and spontaneous commemorations of the civil liberties and political freedoms achieved after the revolution. It commemorates the 25 April 1974 coup and Portugal's first free elections on that date the following year. Construction of the 25 de Abril Bridge began on 5 November 1962. It opened on 6 August 1966 as the Salazar Bridge, named after Estado Novo leader António de Oliveira Salazar. Soon after the Carnation Revolution, the bridge was renamed the 25 de Abril Bridge to commemorate the revolution. Citizens who removed the large, brass "Salazar" sign from a main pillar of the bridge and painting a provisional "25 de Abril" in its place were recorded on film. Many Portuguese streets and squares are named vinte e cinco de Abril, for the day of the revolution. The Portuguese Mint chose the 40th anniversary of the Carnation Revolution for its 2014 2 euro commemorative coin. After an early period of turmoil, Portugal emerged as a democratic country. The country divested itself of almost all of its former colonies and experienced severe economic turmoil. For the Portuguese and their former colonies this was a very difficult period, but civil rights and political freedoms were achieved. The international community censured the Estado Novo regime for refusing to grant independence to its colonies in Africa. Its leaders, Salazar and Caetano, were accused of being oblivious to what Harold Macmillan called the wind of change in Africa. Setúbal, ville rouge (France–Portugal 1975 documentary, b/w and colour, 16 mm, 93 minutes, by Daniel Edinger) – In October 1975 Setúbal, neighbourhood committees, factory committees, soldiers' committees and peasant cooperatives organise a central committee. Cravos de Abril (April Carnations), 1976 documentary, b/w and colour, 16 mm, 28 minutes, by Ricardo Costa – Depicts the revolutionary events from 24 April to 1 May 1974, illustrated by the French cartoonist Siné. Capitães de Abril (April Captains), a 2000 dramatic film by Maria de Medeiros about the Carnation Revolution. The BBC made A New Sun is Born, a two-part television series from the film, for the UK's Open University. The first episode details the coup, and the second narrates the transition to democracy. ^ Association, Peter Booker, Algarve History. 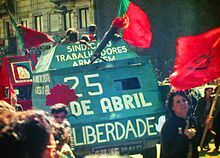 "Why April 25th is a holiday – the Carnation Revolution and the events of 1974". Retrieved 29 December 2017. ^ Birmingham, David (1996), A Concise History of Portugal, JHU Press, p. 184, ISBN 978-0-8018-5158-2, Almost immediately, massive crowds filled the streets, supporting the junior officers, crowds that put carnations in the soldiers' guns, thus helping legitimize and make irreversible the "carnation revolution". ^ a b "Adrian Hastings". The Daily Telegraph. London. 26 June 2001. ^ Arslan Humbarachi & Nicole Muchnik, Portugal's African Wars, N.Y., 1974. ^ Cabrita, Felícia (2008). Massacres em África. A Esfera dos Livros, Lisbon. pp. 243–282. ISBN 978-989-626-089-7. ^ "MOZAMBIQUE: Mystery Massacre". Time. 30 July 1973. ^ "PORTUGUESE PRIME MINISTER (VISIT) (Hansard, 10 July 1973)". hansard.millbanksystems.com. Retrieved 2017-07-21. ^ A direita radical na Universidade de Coimbra (1945–1974) Archived 3 March 2009 at the Wayback Machine, MARCHI, Riccardo. A direita radical na Universidade de Coimbra (1945–1974). Anál. Social, July 2008, nº 188, pp. 551–576. ISSN 0003-2573. ^ a b (in Portuguese) Movimento das Forças Armadas (MFA). In Infopédia [Em linha]. Porto: Porto Editora, 2003–2009. [Consult. 2009-01-07]. Disponível na www: URL: http://www.infopedia.pt/$movimento-das-forcas-armadas-(mfa). ^ Decretos-Leis n.os 353, de 13 de Julho de 1973, e 409, de 20 de Agosto. ^ "The Carnation Revolution – A Peaceful Coup in Portugal – Association for Diplomatic Studies and Training". Association for Diplomatic Studies and Training. 2015-04-13. Retrieved 2018-10-02. ^ Ali, Tariq (2010). 'Preface' in A Calculus of Power. Verso. ISBN 978-1-84467-620-0. ^ Benetech Human Rights Data Analysis Group (9 February 2006). "The Profile of Human Rights Violations in Timor-Leste, 1974–1999". A Report to the Commission on Reception, Truth and Reconciliation of Timor-Leste. Human Rights Data Analysis Group (HRDAG). Archived from the original on 22 February 2012. ^ Fundação da SEDES — As primeiras motivações (in Portuguese), SEDES, Nos anos 60 e até 1973 teve lugar, provavelmente, o mais rápido período de crescimento económico da nossa História, traduzido na industrialização, na expansão do turismo, no comércio com a EFTA, no desenvolvimento dos sectores financeiros, investimento estrangeiro e grandes projectos de infra-estruturas. Em consequência, os indicadores de rendimentos e consumo acompanham essa evolução, reforçados ainda pelas remessas de emigrantes. ^ (in Portuguese) Movimento das Forças Armadas (MFA). In Infopédia [Em linha]. Porto: Porto Editora, 2003–2009. [Consult. 2009-01-07]. Disponível na www: URL: http://www.infopedia.pt/$movimento-das-forcas-armadas-(mfa)[permanent dead link]. ^ "Portugal", Country Studies, U.S. Library of Congress, In the mid-1980s, agricultural productivity was half that of the levels in Greece and Spain and a quarter of the EC average. The land tenure system was polarized between two extremes: small and fragmented family farms in the north and large collective farms in the south that proved incapable of modernizing. The decollectivization of agriculture, which began in modest form in the late 1970s and accelerated in the late 1980s, promised to increase the efficiency of human and land resources in the south during the 1990s. ^ "REGISTRATION OF RELIGIOUS COMMUNITIES IN EUROPEAN COUNTRIES" (PDF). ^ Almeida, Manuel de Jesus. Watchtower, 7 January 1999. pp. 23–27. ^ "Commemorative coins". European Commission - European Commission. Archived from the original on 19 October 2017. Retrieved 21 July 2017. ^ "Setubal Ville Rouge". ISKRA. Retrieved 19 January 2018. ^ "A New Sun Is Born Part 1 The Coup (1997)". ^ Boyd van Hoeij (22 August 2013). "Longwave (Les Grandes Ondes (a l'Ouest)): Locarno Review". The Hollywood Reporter. Retrieved 28 March 2014. ^ "Les grandes ondes (à l'ouest) (2013)". IMDb. Retrieved 28 March 2014. Barker, Collin. Revolutionary Rehearsals. Haymarket Books. First Edition, 1 December 2002. ISBN 1-931859-02-7. Maxwell, Kenneth, 'Portugal: “The Revolution of the Carnations”, 1974–75’, in Adam Roberts and Timothy Garton Ash (eds. ), Civil Resistance and Power Politics: The Experience of Non-violent Action from Gandhi to the Present. Oxford & New York: Oxford University Press, 2009, pp. 144–161. ISBN 978-0-19-955201-6. Wikimedia Commons has media related to Revolução dos Cravos.